A roll scratch is a straight deepening which is going in lengthways direction to the wire rod. The form of a roll scratch can be broad with low depth or also pointed with a greater depth. The defect arises if the rolling piece drags at leaderships or at other rolling accessories. 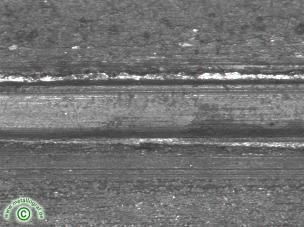 Roll scratches, which are available at the pre-material (billet), can lead to a pincher when rolling further to the ready profile. The defect on hand is a roll scratch which has arisen after the last rolling stand. This is visible on the raised edges of the defect.